See among your friends who gets the most steps in one work week. Fitbit has a great feature called “Challenges.” Every week, you can invite your friends to participate in the “Workweek Hustle.” Fitbit keeps track of the progress of all your friends throughout the week. 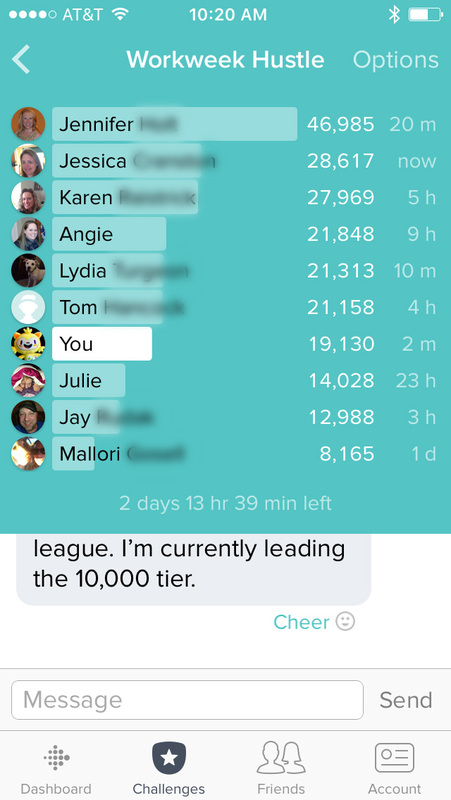 Fitbit makes it fun to check in regularly to see who has the lead, and where you stand in the rankings. However, it’s not as much fun when you are always at the bottom of the list. With step tracking, you’ll find that some of your friends are absolute fanatics with getting many thousands of steps–especially if they are long-distance runners. I tend to be near the bottom of the pack in our weekly challenges. So I’ve developed a technique that makes me feel better about my low rankings. Instead of looking at the top people all the time, just ignore them. Focus on the a couple people are around the same range as you. You’ll see me in the bottom third. That bottom third is pretty much my regular spot. Thus, the bottom third is my league.